S ince the early 1920s, North Carolina’s gas tax has remained the major source of transportation funding in our state. Originally 1 cent/gallon, it is currently 37.5 cents/gallon –based on a variable rate. That rate is 17.5 cents per gallon plus 7 percent of the average wholesale price. The variable rate was put in place to address fluctuations in consumption due to pricing. The higher the wholesale price, the less the public consumed, therefore a higher variable component of the tax was levied to keep revenue somewhat neutral. When the price fell and consumption increased, the tax dropped. In 2011, President Obama announced an agreement with thirteen large automakers (which account for more than 90 percent of all vehicles sold in the U.S.) to increase fuel economy to 54.5 miles per gallon for cars and light-duty trucks by 2025. That represents a 5 percent increase in fuel efficiency per year, starting in 2012. 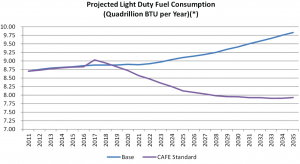 That increase in fuel efficiency means we’ll all be buying less gas. Increased fuel efficiency is g ood; good for the environment and for drivers. But, buying less gas also means paying less in gas tax, and now the future of our state’s most important transportation source has become starkly clear. 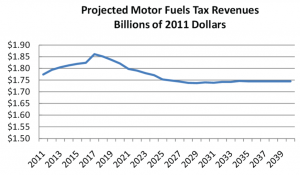 NCDOT projects motor fuel tax revenues to increase slightly until 2018, then decrease until about 2028, and remain flat until 2040. In the face of a growing population, and rising costs to build and maintain transportation infrastructure, our gas tax will only yield about $33.9 billion from 2011-2040. Target LOS: A robust transportation system that meets projected needs, addresses growth, ensures safety, offers convenience and accessibility and fosters economic opportunity. Fund at Current Levels: The last option is to stick with the funding we have in place already, which is far below that required to keep our transportation network at even the same service level (LOS C). 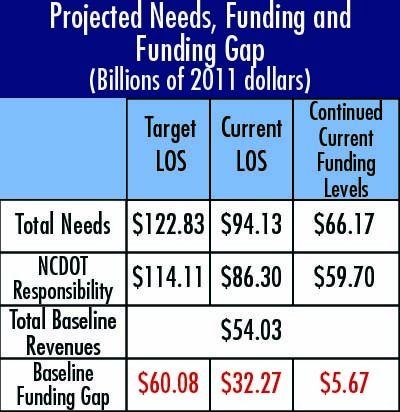 Through the 2040 Plan period, the NCDOT will need to invest at least $86.3 billion (in 2011 dollars) just to maintain existing Level of Service (LOS) conditions and $114.1 billion to improve the transportation network’s performance and capacity (Target LOS). Even simply keeping funding at its current level, there is not enough projected revenue forecast.